The Chatham Arts Council, through the NC Arts Incubator is hosting the Fearrington Artists Exhibit. The exhibit will run through mid- July at the PAF Gallery. 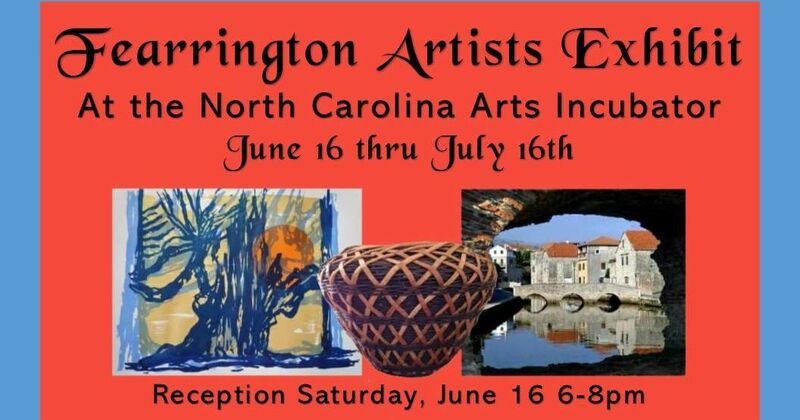 To kick off this event join the NC Arts Incubator in Siler City Saturday Jun 16thfor the Opening Reception of the Fearrington Artists Exhibit. There will be artists, refreshments, live music and ART! Join in the celebration of a wide variety of mediums from the Fearrington Artists, including sculpture, screen printing, photography and more! Live music from Dylan Branson and refreshments served! This event coincides with the popular Saturdays in Siler so come where you can enjoy the Traditional Japanese Drum Group Earth Spirit Taiko. Drumming workshop begins at 6 with performance to follow. Audience members are welcome to participate! Bear Creek Brewery, Mr. B’s Chicken, and Courtyard Coffee will be there to provide you with refreshment and all downtown shops and galleries will be open! Twin Birch and Teasel will be doing a demonstration of “Swatch” a Japanese style of weaving. Come on Out!! !